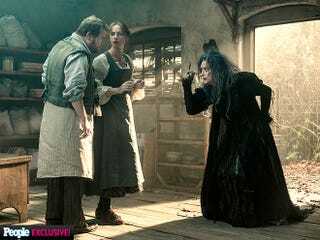 We're still not super sold on Disney's Into the Woods movie adaptation, especially after the tragic news about all the massive cuts the movie sustained. But the Baker and the Baker's wife both look great. What do you think? Thanks to People, we now have a few glimpses of Disney's Into The Woods — and you can see that Jack and Red Riding Hood have been aged down tremendously. This reflects the cuts to the script (Red will no longer be seduced by the Big Bad Wolf). And speaking of the Wolf, the only glimpse of Johnny Depp we're getting as the wolf is hidden by a tree... not a great sign. Sigh this movie. Please please please be good.